January 27, 2014: Each year, world leaders and academics from across the globe congregate in Davos at the World Economic Forum Annual Meeting to deliberate on global issues. This year, the forum was themed, “The Reshaping of the World: Consequences for Society, Politics and Business”. Our President Sania Nishtar was also amongst the participants. In particular she was amongst the 60 global leaders who were invited to attend the “Health and Economic Growth Summit ”, also attended by Prime Minister of Norway, and the President of Estonia, President of Finland and Ministers of health and finance from many countries. 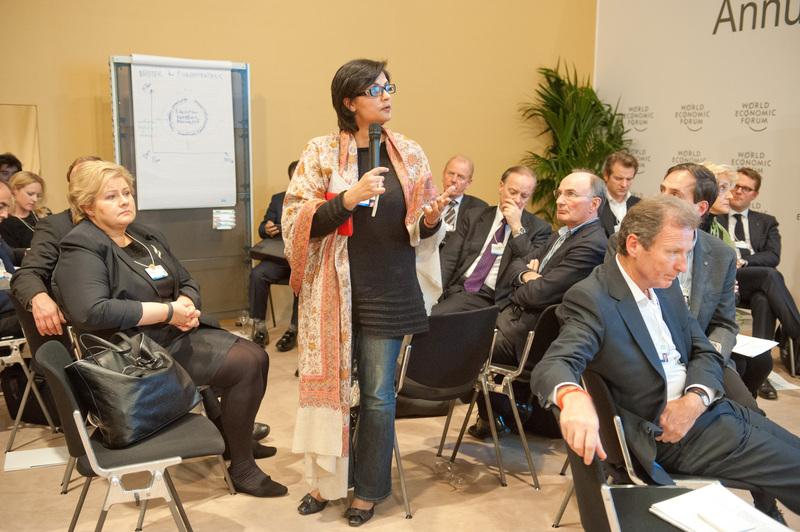 Sania Nishtar was also a discussion leader along with Omar Ishrak, CEO of Medtronic on the session on “Health Systems Leapfrogging in the Emerging Economies ”. January 27, 2014: The Government of Sudan is adopting different modalities for providing health coverage for its citizens. Within this context, the World Health Organization, Sudan Office, National Health Insurance Fund, the European Union and their partners this year co-hosted the International Conference on Roadmap to Universal Health Coverage from 25-26 January, 2014 in Sudan. Our president, Dr. Sania Nishtar connected via a videolink to talk about innovations in financing critical to achieving universal health coverage in mixed health systems. The title of her talk was “Beyond Bismarck and Beveridge: financial innovations to achieve UHC”. 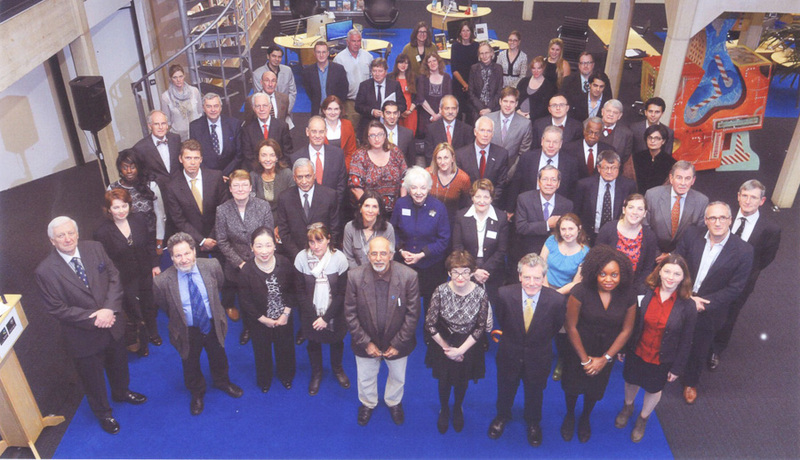 January 21, 2014: The annual Emerging Markets Symposium, a distinctive tradition of the Green Templeton College of the Oxford University, themed on Maternal and Child health and Nutrition this year, was held from January 9-12 at Egrove Park, Oxford UK. Each year, the Symposium brings together authoritative and influential leaders in public and private sectors from all around the world to reflect on different issues in the Emerging Markets. This intensive three-day meeting concluded with actionable recommendations in the penultimate session of the symposium, “What Should be Done”. This session was chaired by our President, Dr. Sania Nishtar along with Suman Bery, Tsung-Mei Cheng, and Serra Kirdar-Meliti. Dr. Sania Nishtar was also a plenary speaker with Dr. Rifat Atun, Peter Bourne and Uwe Reinhardt, chaired by David levy. January 20, 2014: The Muslim-Science.Com is an online journal, dedicated to “the revival of scientific, and science-based innovation and entrepreneurial culture in the Islamic World”. 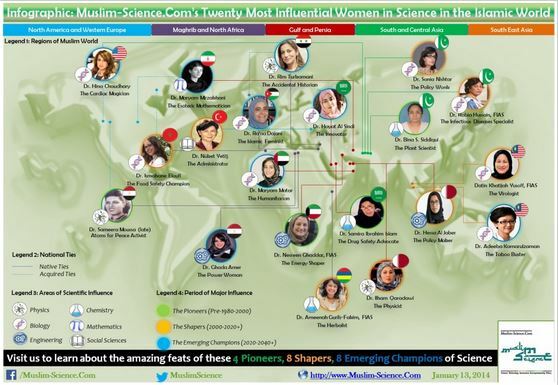 In 2014, it has launched its first list of ‘Top-20 Most Influential Women in Science in the Islamic World’ which encompasses 20 women from all over the world for their outstanding achievements as Pioneers, Shapers and Emerging Champions. In recognition of Dr. Sania Nishtar’s policy advocacy contributions to the development of science and innovation of the Islamic World, she has been listed as the Shaper amongst the top 20. More details can be viewed here. January 10, 2014: With the new year, come new hopes and new challenges for governance of the country. One way to ensure excellence in leadership performance is through transparency and accountability in decision-making. Our President, Dr. Sania Nishtar urges on this singular prerequisite through her recent article simultaneously published in The News International and in Huffington Post. Your comments and views are welcome through Heartfile eForum. However, assessing governance effectiveness is a challenging task from an empirical standpoint and often information has its limitations in conveying the real impact of poor governance at the granular level – a level that can indicate the quantum of human suffering as a result. It is with a view to outlining this granularity that I have chosen to narrate the story of a family rather than attempting an assessment of governance through the standard governance empirics approach. The family lives not very far from a cosmopolitan city and has 13 members who subsist on a monthly income of less than Rs. 5,000 a month. There are many women of child-bearing age in the family, but none has been to an antenatal clinic or has had the privilege of giving birth in the presence of a skilled birth attendant, because the government health facility close to their village is perpetually shut. Its earmarked budgets are probably being systematically siphoned off. The situation is similar for public schools; they remain closed and run ghost operations. As a result, children are out of school because their parents cannot afford private school fees. Outside their home, sewage and broken water pipes remain untended because local government officials have created systematic channels of pilfering resources from the system. The children repeatedly suffer from vaccine-preventable diseases because of gaps in the immunisation programme, despite it being relatively well-funded for decades. The grandmother in the house has lost a limb in a suicide attack. But every time she goes to the local social protection agency to claim a constitutionally-mandated allowance, her files are either lost in piles of paper or she confronts an entrenched system of rent-seeking that excludes the true deserving. The breadwinner of the house has been swindled by a local agent who lured him into believing that he will be sent to the UAE for work. As a result of this fraud, the family has incurred heavy debt, which is perpetuating their poverty even further. A nephew has been killed as a result of gang and mafia activity, which often operates with the connivance of local political officials. One of the girls in the family was molested in a house where she worked as a domestic servant. Unfortunately, the police will not file a case because they are in cahoots with local officials. One uncle in the family is behind bars for alleged petty theft but the family hasn’t seen him in months because they feel constrained to pay the ‘entry-level bribe’, which is the norm. The other uncle in the family was a clerk in a public sector enterprise. But when the country privatised the agency, they did not cater to the rights of pensioners, which left him and many others in the lurch. Finally, and needless to say, the impoverished family often has to endure up to 10 hours of loadshedding in a context where public officials responsible for energy security cannot be held accountable. This story provides a snapshot of how corruption touches the lives of poor individuals. Behind the suffering are creative mechanisms, which extract illicit rents at every level and where well-established shadow ‘rules’ govern the de facto functioning of departments, ensuring systematic distribution of rents to respective hierarchies. The onus of responsibility is not just on successive governments but also on private entities and individuals who fuel and further these practices. All problems highlighted in this story can be translated into governance jargon – ghost schools, ghost health facilities, informal payments, institutionalised rent-seeking, regulatory failures, theft and pilferage, embezzlement, illegal fees, bribery. Each one of them is a ‘manifestation’. Just like unexplained rains and flash floods herald climate change and fever indicates disease, corruption denotes deep-seated systemic failures of governance. At the core of it is a triad: weak governance, thriving black markets, and a legacy of patronage. When these attributes get systemically institutionalised within systems, systemic manipulation becomes a norm, misuse of authority becomes entrenched, and vested interest groups flourish. When they get deeply ingrained, political links are furthered by patronage and, over time, institutional erosion sets in; the rich-poor divide is augmented, governance becomes exploitable, and reforms are held hostage. Human security and national security are both compromised as a result. These attributes of the ‘state’ system do massive injustice to the Pakistani ‘society.’ State and society are not synonymous – the former is a subset of the latter. Pakistan is a country of great potential. Its people are hard-working, entrepreneurial, and resilient; the society at large is massively giving and supportive. The country has several untapped strengths inherent to its body politic. While several governance-level reforms are needed to unlock this potential, a singular prerequisite is transparency and accountability of decision-making in public sector performance. The year 2013 ended with Pakistan improving its ranking by 12 places in Transparency International’s Corruption Perceptions Index 2013. This year – 2014 – should build further on this stepping stone. Rather than punitive action, which does not provide a sustainable solution, the key is to focus on building institutions and systems that limit opportunities for collusion, graft, and arbitrage in the first place.